« 11/3 Good grief, it’s November! 11/10 Komatsuna, taco mix, and basil! The head of lettuce is very dense. It yields more salad servings than you might imagine. 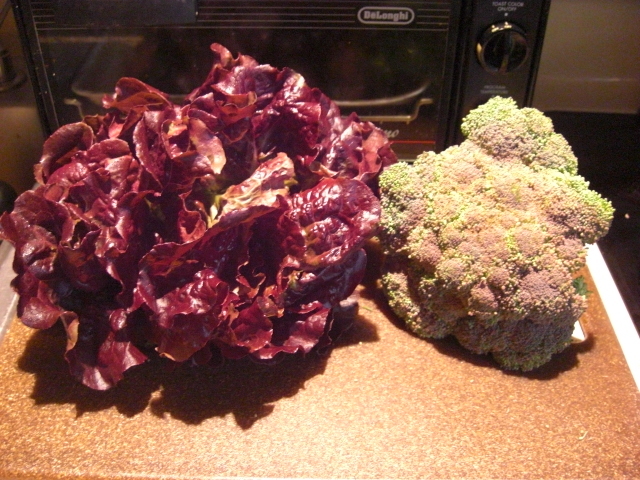 Also, don’t sweat the brown/yellow color on the broccoli. It’s from cold weather and doesn’t affect the taste. Steamed broccoli became the vegetable of choice at so many restaurants that I got tired of it. Local broccoli right out of the ground, however, brings the romance back. And don’t’ forget the stems! When the broccoli’s good, the stems are good, too. The trick is not to cook them with the florets. You’ll either end up with mushy florets or hard stems. 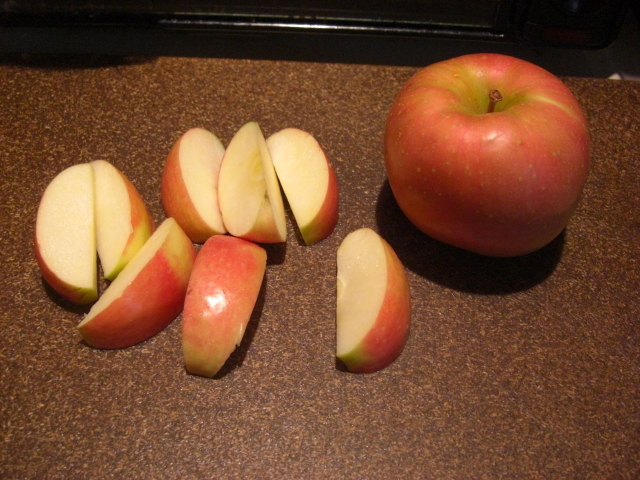 Chop the stems into pieces or rounds and steam or stir-fry them longer. Lots of yummy broccoli flavor there. I’ll probably blanch and freeze the spinach. 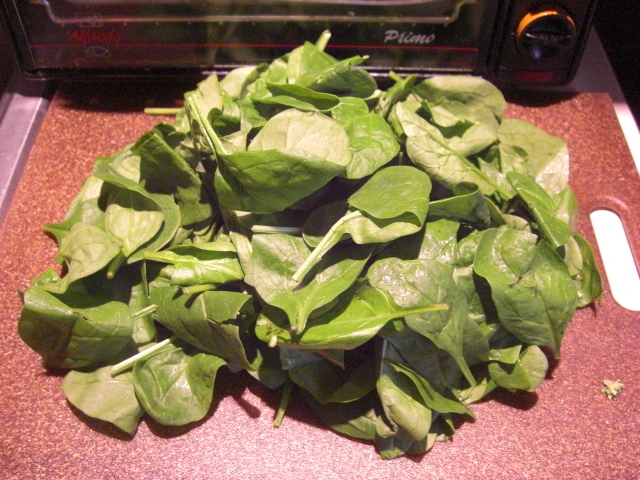 It seems unfair because a spinach salad would be nice, but the hard truth is you can freeze spinach, and you can’t freeze lettuce. Komatsuna greens are the tastiest greens around. These are the first greens Chris and I learned to tolerate. 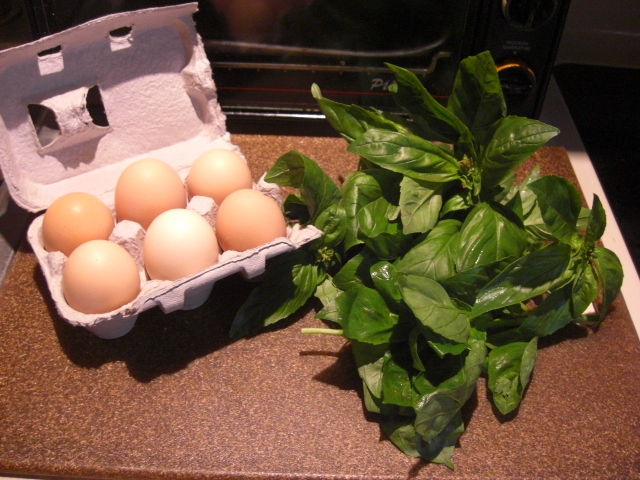 If you like greens, make these according to your favorite recipe. If you’re not such a greens fan, slice them thin and add them to a stir-fry. 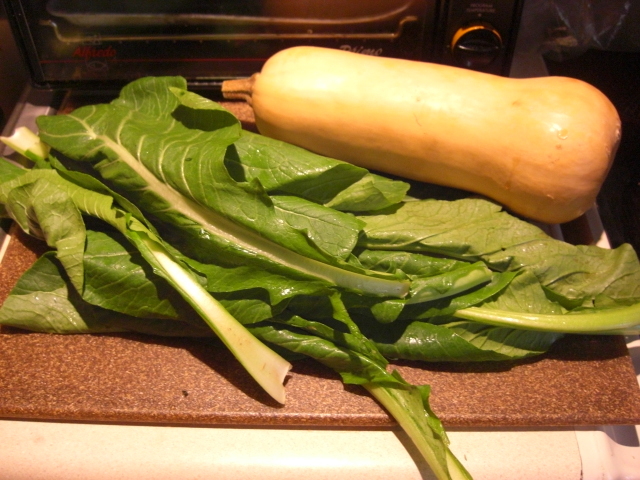 Or follow our favorite greens recipe and substitute Komatsuna for kale. What a handy combination! If traditional tacos don’t sound like you, you could try a taco salad. 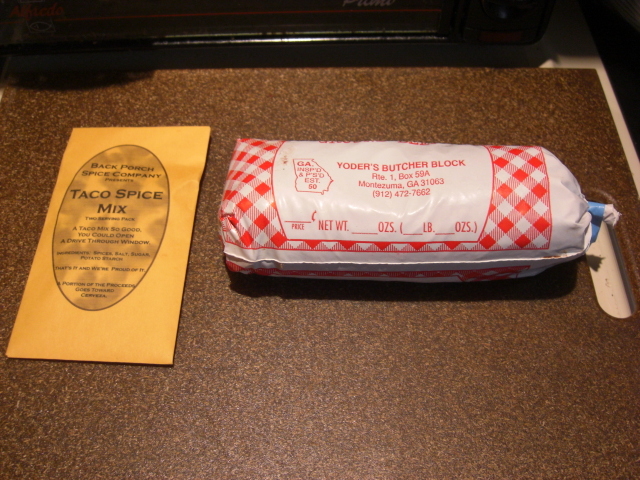 Or broaden the list of things that go in tacos. Chris and I made beef (sadly, seasoned with store-bought taco spice), arugula, and caramelized onion tacos. We were very happy. 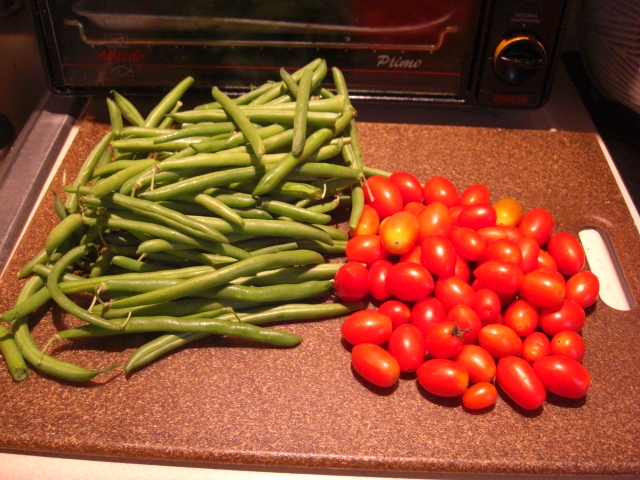 The green beans are the slender kind, so this time I will sauté some rather than simmering them Southern-style. One method calls for boiling and blanching the beans, sauteing some garlic and chopped tomatoes in olive oil, and finally tossing the blanched beans in the mix. I couldn’t find that exact recipe online, but here’s one close to it from Morton’s Steakhouse. 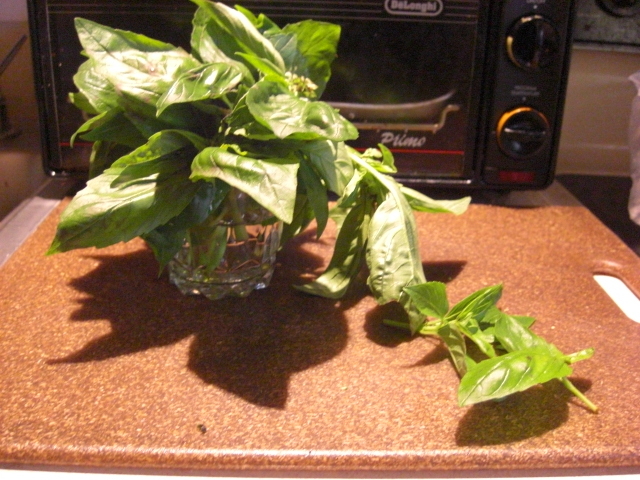 The bouquet basil I’ll use with the little tomatoes to make a tomato-basil-Parmesan pasta some time this coming week. 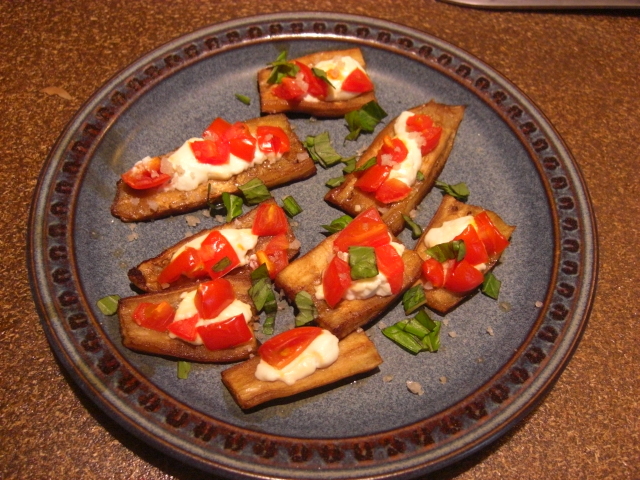 The short-stemmed pieces I’ve already used on an eggplant appetizer.